We’re in the middle of the brief and glorious chestnut season in the Waikato. Chestnuts are a seasonal treat, so I aim to make the most of them. For a few brief weeks they’re dropping off trees everywhere – and then they’re gone until next year. 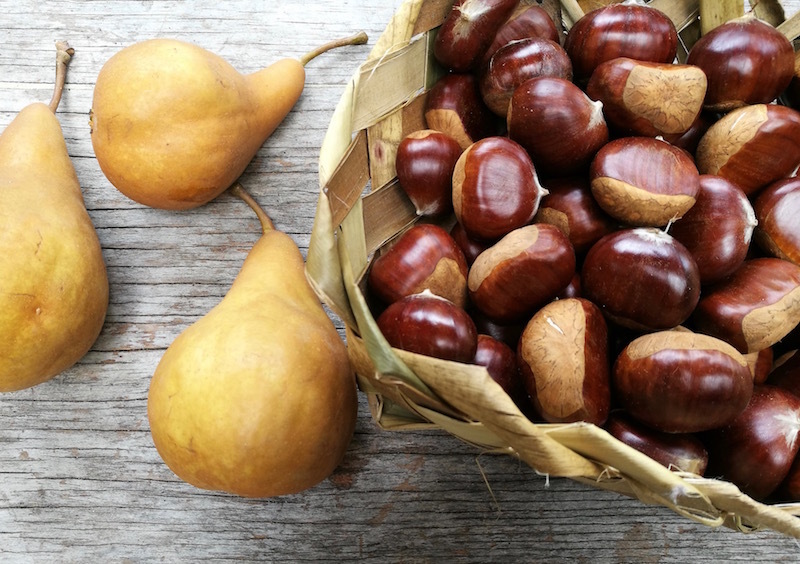 In this post I share a couple of my favourite chestnut recipes. Including the most divine chestnut-chocolate pudding. Also the best way I’ve found to peel chestnuts. Use your chestnuts now! Don’t leave them in a bag in the fridge. Even in cold storage chestnuts will go mouldy. Been there, done that! For more about local chestnuts, check out my post here where I talked to chestnut industry veterans from the New Zealand Chestnut Council. Here’s my pain-free hack for musicians and everyone else who hates scalded fingers. Most recipe books say chestnuts must be peeled while they’re boiling hot. But I’ve found that the following method is much easier on my fingertips. NB This system works if you want chestnut crumbs or puree or broken chunks of chestnut. If you need whole chestnuts, use a special chestnut peeler (available from the NZ Chestnut Council, see the reference at the end of this post) and peel before cooking. Place chestnuts in a saucepan of water. Turn off the heat and leave the pan for approximately an hour and a half. The water will still be warm, but not so hot that it burns your fingers. Using a slotted spoon, take two or three chestnuts at a time out of the water and place on a wooden board. With a small sharp knife, cut chestnuts in half and scoop the insides out of the shell. Sometimes they just pop out, but sometimes you have to use a teaspoon. This is much easier to do while the chestnuts are warm, so leave them in the hot water until you’re ready to cut them in half. 1kg of chestnuts gives approximately 5 cups of peeled chestnut meat. I think this is by far the best way to eat chestnuts. Chestnuts and chocolate are a match made in heaven. 2 cups of peeled chestnuts, simmered in a small amount of water to cover until they are very tender (approx half an hour to 45 minutes). Put through a mouli (ideally) or process until very smooth. Fold into the chestnut-chocolate mixture. It’s even better 24 hours later, if you can hold out that long. Peel and de-seed pumpkin and chop into pieces. Bring to the boil and simmer for 45 minutes or longer – until everything is soft. Run through a mouli or use a stick blender to blend until smooth. Check seasoning and add more salt and pepper if needed. Serve with a dash of cream, kefir or coconut cream (to balance the sweetness of the pumpkin) and a sprinkling of finely chopped parsley.